These photos were taken at Southdown School, when it was situated in Southdown Road. Do you recognise anyone in the photos? This page was added by Sylvia Woolford on 04/05/2009. Thanks for posting this! 2nd from left, as you look at the class photo, I believe is my late brother Rod Vinall. I think that's him to the left of the football team as well. Thanks Terry that all brings back old memorys. 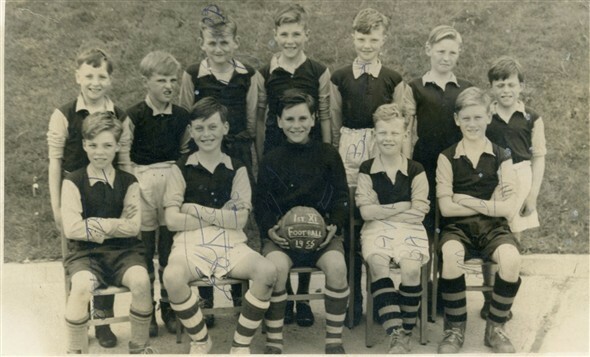 Back row 2nd front left Terry Turnball he drowned in the mud hole, next Gavin Groves then me Malcolm Black. Then I think that was Avnall? then Allan Mclauchlan and Rod Vinall. Front row, holding the ball Michael Wallace, to his left David Bains, and Terry Chinchen. On Mikes right Ted Row. Front row on the outer left as you look at photo is Trevor Lawrance. Re the class photo: I recognise some faces but am unable to put names to, but these are some I can. Class photo - centre row 4th from the right is Pauline Doyle, front row 4th from the right is the late Angela Groves and on her left 3rd from the right is Margaret Willey. Back row third from left Gillian Player. Class Photo. Although I didn't attend this school there are some very familiar faces that I am able to put names to. Back row from the left as follows; 3rd Gillian Player, 4th Mike Groves, 5th Terry Chinchen, Rod? Avenall. Middle row from the left; 2nd Frank Sexton, 5th Pam Crick ? 6th Pauline Doyle, 7th Ann Mitchell, 8th Bob Delacourt. 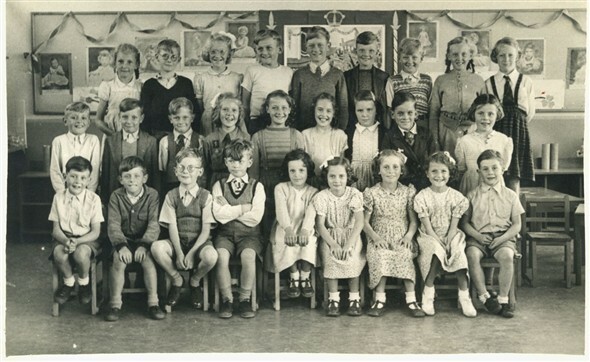 Front row from the left; 2nd Rod Vinall, 3rd Dave Bains, 6th Angela Groves, 7th Margaret Willey, 8th June Vanderhoven ?